Opti Temp designs and manufactures a full range of custom refrigerated chillers and non-refrigerated heat exchangers. Superior technologies using the most highly reliable components ensure that Opti Temp’s chillers and heat exchangers will exceed customer expectations for heat transfer solutions. Opti Temp has demonstrated a superior ability to design custom thermal management systems and has proven to be a reliable supplier of refrigerated chillers and non-refrigerated heat exchanger equipment for a number of government contractors, as well as key industrial and academic players in photonics, food processing, plastics, and semiconductor industries. 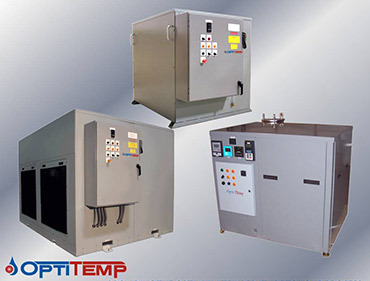 Opti Temp will build a standard system, or design a custom cooling system to meet your individual requirements for size, portability, operating conditions, thermal load, and system footprint. And with our new chiller and heat exchanger fabrication facility in Traverse City, Michigan we are now able to design, develop and mass produce standard chillers and heat exchangers, as well as custom thermal management solutions for almost any industrial or commercial application. Our chillers and heat exchangers feature easy to use standardized control components which are time tested and widely available throughout the global marketplace to create a cooling system engineered for years of reliable service. 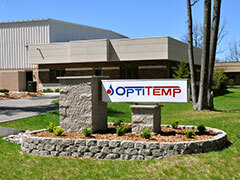 All Opti Temp systems feature a full one-year parts and labor warranty. Opti Temp moved into a new state of the art manufacturing facility in 2008 that will ensure we are positioned to continue meeting the needs of our customers now and into the future. Our commitment to providing quality thermal management products which fulfill the ever increasing demands of new and innovative applications remains paramount to our success. Please call (231) 946-2931 or contact Opti Temp to discuss your custom heat transfer solution.